Total E&P Bulgaria, and its Partners in Han Asparuh exploration project, OMV and Repsol donated up-to-date equipment worth 75 thousand euro to Sofia University St. Kliment Ohridski. The items include the most up-to-date laboratory photometer, camera, projector and compasses for field practicum of the students. 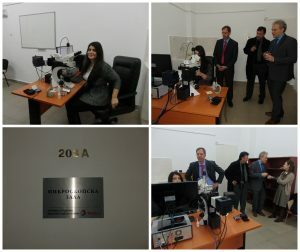 The donated equipment is highly appreciated by Sofia University St. Kliment Ohridski as it will give the Geology and Geography Faculty students the chance to improve their expertise in the field of geology. The donation was announced during the official ceremony of awarding diplomas to graduates of the Geology and Geography Faculty (Sofia University St. Kliment Ohridski) on January 13, 2017. During the event Mr. Xavier Faugeras received a donation certificate which acknowledged Total’s true support and commitment to train Bulgarian specialists. The donation is a visible result of the program Total and its Partners have been developing to provide learning opportunities to Bulgarian students. “We are really glad that we could support Bulgarian students. We believe that through using such advanced appliances they will be able to deepen their knowledge in the most professional and efficient manner.“, Mr. Xavier Faugeras, General Manager of Total E&P Bulgaria, said.